Tagged under Range Murata, Gonzo, Series. Fun? This is why I watched Last Exile until the end in the first place. Every moment has a great amount of suspense and drama not to mention a sense of grandeur. You can practically feel all kinds of emotions in this anime (except humor); despair, happiness, sadness or just plain frustration. 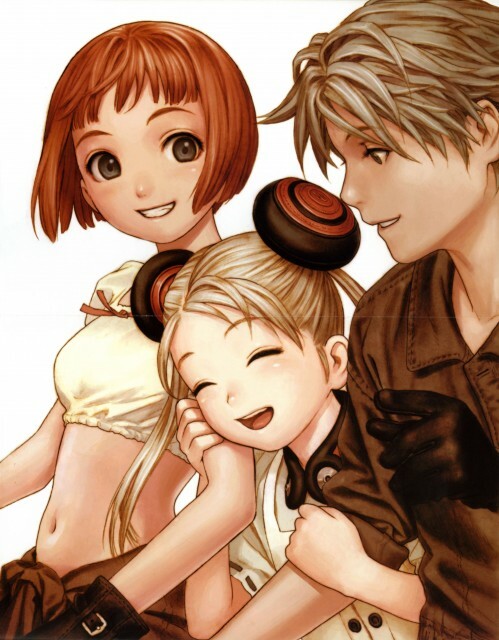 Last Exile also gives you the feeling that you are altogether in a new world where flight plays a major role in our lives. I would recommend this anime to you since it has left me feeling glad that I completed this anime (I have a habit of stopping halfway through animes I do not like). Last Exile however, is a rather complex anime and some of you might find it confusing at first. The first half of the series is rather slow in regards to the pacing, but the second half of the series is where it gets better and I was rather surprised about Sophia being royalty. One other issue I have is the animation direction, it seems to be disjointed where at certain episodes the quality looks good, but at other times it looks bad, mere background characters looking static, facial expressions looking plain and not detailed in areas, and the color scheme looks rather drab in areas. So pretty much I feel this has not aged well. The ED song is pretty good and fits the tone of the anime, but I don't really like the OP song...something like a Maaya Sakamoto or Akino Arai song would've been a better choice for an opener. At times I get Turn A Gundam vibes from this series especially since the heroine of Last Exile, Lavie reminds me a little bit of one of Turn A's heroines, Sochie Heim. My overall feelings about it is that it's a good series with amazing characters, Claus and Lavie's relationship is endearing even though it's not a romantic one, but the climax felt rather underwhelming. great story. great fighting scenes and flying machines. great politics. great atmosphere created. The two adjournment episodes gave insights into how and why things happened the way as we see it. yet, since there were so many stories in the first season, a mere episode just isnt enough to summerise everything. nevertheless, a good effort to link 1st and 2nd seasons together. music as always fantastics. well..awesome-st story line you might have ever had. (i guess you might have known this anime via many other sources). World with flying ships in sky, a country got vanished by a war, Sky pirates in complete action. I guess thats enough to create interest. One of the best works ever. This is such a unique series. I started it ages ago but never finished it...And now I'm restarting it again! I really liked it but couldn't get the other dvds! The character and mechanical designs by Range Murata are amazing! Stunning art and great story. Can't wait to finish it. To fly in a free sky, you must first fight for that sky. An interesting clash of time periods driven by a compelling story of the unfortunate path to freedom. Could have ended better, but still a great all rounder. Amazing, intriguing and rather unique designs in characters, backgrounds and machinery. Good anime to see if you are also interested in aviation, with a great storyline, visuals and an exotic, musical score to boot. Alex Row is one of the coolest male characters ever created for an anime. Excellent show, the best Steampunk title out there (I make no apologies, Steamboy!). Has many nods to other classic series, plus plenty of great characters, a good storyline, and a fantastic soundtrack. I've seen the sub and the dub, and they're both well done. Hard to believe that Gonzo built this from the ground up, but then again, they had Range Murata on their team! This is my favorite anime of all time. Range Murata's artwork is quite possibly the most beautiful style I've ever seen. I own the "limited edition boxed set" that includes all original RM art for the series on the dvd cases. Dream vehicle: Vanship with an unlimited fuel supply and refitted for a single pilot.